The Library of Virginia is one of the oldest agencies of Virginia government, founded in 1823 to preserve and provide access to the state's incomparable printed and manuscript holdings. The collection which includes books, periodicals, government publications, newspapers, architectural drawings and plans, manuscripts, archival records, maps, rare books, prints, and photographs, is the most comprehensive resource in the world for the study of Virginia history, culture, and government. 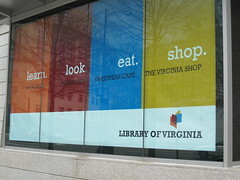 The Library of Virginia also offers exhibitions and programs, which include presentations and book talks. The library provides activity booklets for children that are age appropriate interpretations of each exhibition. 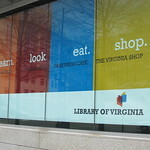 Tours of the Library of Virginia are also available but must be arrange with advance notice by calling 804-692-3901.